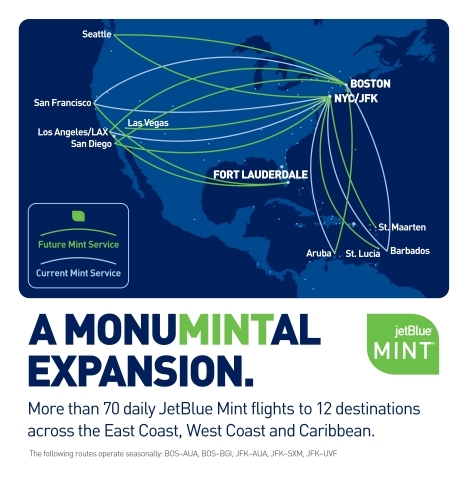 NEW YORK--(BUSINESS WIRE)--JetBlue (NASDAQ:JBLU) today announced an expansion of its popular Mint premium experience on transcontinental routes, seizing an opportunity to introduce competition in east and west coast markets where customers are faced with a decreasing number of choices and where other carriers sell dated business class options at a high cost. The next tranche of routes will bring Mint to four cities for the first time – Fort Lauderdale, Las Vegas, San Diego and Seattle – while also increasing customer options from New York (JFK), Boston, Los Angeles (LAX) and San Francisco. All Mint service is offered on new Airbus A321 aircraft with JetBlue’s reinvented Core experience for every customer on the flight. Since launching in 2014, Mint has become a favorite way for celebrities, technology executives, creatives, and entrepreneurs to travel across the country. Mint’s highly personalized service, lie-flat seating, and curated food and amenities – all offered at an accessible price – has opened the door to premium travel for customers shut out by the high cost of traditional airline offerings. Mint was recognized by Fast Company’s Innovation By Design Awards, which honors innovative and disruptive design that pushes boundaries and seeks to change the world. JetBlue has already expanded Mint routes based on its early popularity on the initial routes between New York-Los Angeles and New York-San Francisco. It recently launched service from Boston, and is growing both seasonal and year-round Mint service in the Caribbean, with flights to Barbados, Aruba, St. Lucia and St. Maarten. The new Mint cities have strong demand for premium travel. The routes will begin launching in the first quarter of 2017 and planned launches will continue into 2018. JetBlue will take delivery of nine A321s with Mint in 2017, with additional Mint aircraft deliveries planned for 2018. Seats for new Mint routes will be available for purchase in the coming months. Mint offers a completely rethought design and a more human approach to service, addressing the needs of the modern traveler. Mint features exceptional hospitality from specially trained crewmembers and a thoughtful product offering. Mint aircraft include the longest fully-flat bed seating in the U.S. domestic premium market (a), fully enclosed private suites and a 15-inch flat screen with complimentary entertainment options. Favorite Mint features include a signature cocktail, a tapas-style menu by New York City restaurant Saxon + Parole, fresh espresso from the first purposely-built cappuccino machine for a U.S. airline, amenity kits by Birchbox, and dessert from Blue Marble and Mah-ze-Dahr Bakery. 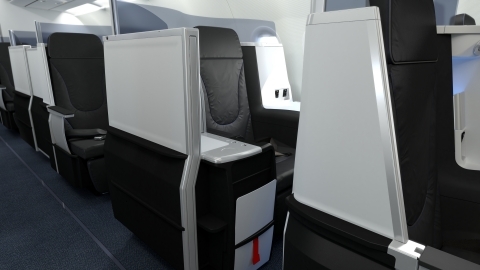 Mint is offered on new A321 aircraft, which also include JetBlue’s new core experience for everyone seated in the cabin. Features of the A321 core interior include 10-inch television screens with free entertainment, comfortable seats with the most legroom in coach (b) and power outlets accessible to all customers. These flights offer free Fly-Fi high-speed broadband Internet service when flying over the continental U.S., access to Amazon streaming entertainment and JetBlue’s Hub content on personal devices and first-run Hollywood movies. All A321 aircraft with Mint include JetBlue’s popular marketplace, a self-serve station full of snacks, sodas and water for customers to enjoy at their convenience, which is also available throughout the flight. 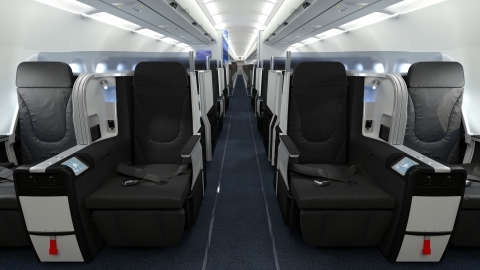 (a) JetBlue offers the most legroom in coach, based on average fleet-wide seat pitch for U.S. airlines.